‘DECENT CHAPS JAZZ & SWING’ fronted by Alan Walker an International Artist, has played at many prestigious events up and down the country. They have appeared and played for Jimmy Carr, Kate Adie, Baby Lifeline Charity Events, Nick Owen and ‘Freddie’ Flintoff to name just a few. Alan Walker has played all over the world with many famous bands including Pasadena Roof Orchestra, Shakatak, The Supremes, Chantilly Lace and also appeared with Kenny Baker, Eric Delany and Buddy Greco. He has composed and performed music for television and radio. The ‘Chaps’ always wear tuxedos, thus adding to the overall ambience of the occasion and can play background music whilst you are dining, or music to dance to later in the evening. The repertoire is large and very varied and includes Jazz, Swing, Latin, ‘Rat Pack’, 1920s-1940s, Boogie-woogie & Jump-Jive material. If you would like a piece of music for your first dance that is not in the repertoire, let us know and we will arrange it for the band. The instrumentation comprises Clarinet, Saxophones, Flute, Piano, Vocals & Backing Vocals, Double Bass, Guitar & Drums. 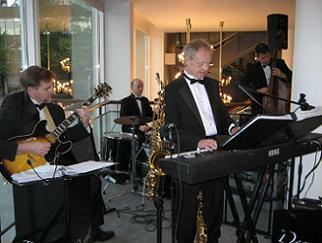 This is an EXCELLENT professional band – we have fantastic testimonials – book ‘Decent Chaps’ today without delay!! We can send you a brochure/testimonials/demo – just ask. No event too large or too small!